Area: 438,317 sq. km; about twice the size of Idaho. Cities: Capital — Baghdad (5.7 million, 2004 estimate). Other cities — Basrah, Mosul, Kirkuk, Sulaymaniyah, Erbil. Terrain: Mostly broad plains; reedy marshes along Iranian border in the south with large flooded areas; mountains along the borders with Iran and Turkey. Climate: Desert, mostly hot and dry. Nationality: Noun and adjective — Iraqi(s). Population (July 2011 est. ): 30,399,572. Population growth rate (2011 est. ): 2.399%. Ethnic groups: Arab 75%-80%, Kurd 15%-20%, Turkoman, others approximately 5%. Religions: Muslim 97% (Shi'a 60%-65%; Sunni 32%-37%), Christian and others approximately 3%. Languages: Arabic (official), Kurdish (official), Turkoman (a Turkish dialect), Assyrian, Armenian. Education: Years compulsory: primary school (age 6 through grade 6). Literacy (2006 UNESCO est.) — 74.1%. Health: Infant mortality rate: 41.68 deaths/1,000 live births. Life expectancy — 70.55 years. Independence: On October 3, 1932, Iraq gained independence from British administration under a League of Nations mandate. Several coups after 1958 resulted in dictatorship, with the Ba'ath Party seizing power in 1963 and again in 1968. 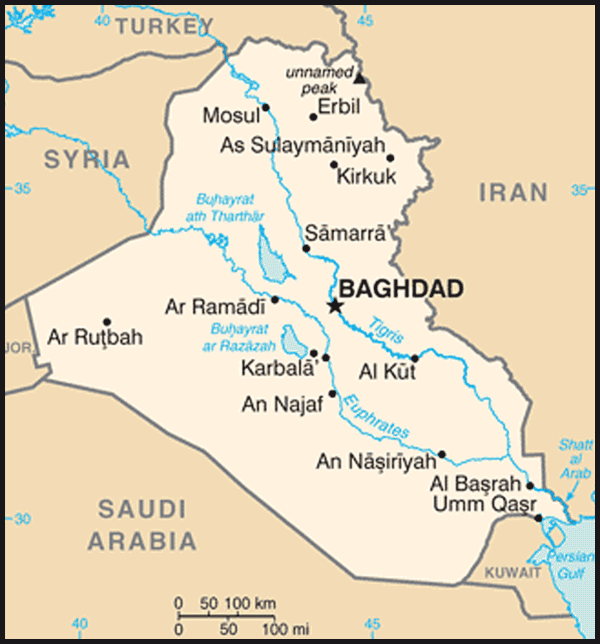 From July 1979 to March 2003, Iraq was ruled by Saddam Hussein and the Ba'ath Party. The Coalition Provisional Authority (CPA) assumed administrative and security responsibility for Iraq following the March-April 2003 overthrow of the regime, while Iraqi political leaders and the Iraqi people established a transitional government. On June 28, 2004, the CPA transferred sovereignty to the Iraqi Interim Government. A new 4-year, constitutionally-based government took office in March 2006, and a new cabinet was installed in May 2006. On June 31, 2009, U.S. troops withdrew from urban areas, a step that reinforced Iraqi sovereignty. On March 7, 2010, Iraq held a second round of national elections to choose the members of the Council of Representatives and, in turn, the executive branch of government. U.S. Forces-Iraq drew down to 50,000 troops by August 2010 and departed Iraq entirely on December 18, 2011, with the conclusion of the Security Agreement. Branches: Executive: Presidency Council (one president and up to three vice presidents); Council of Ministers (one prime minister, three deputy prime ministers, and 30 cabinet ministers). Legislative — Council of Representatives (COR) consisting of 325 members. Judicial — Supreme Court appointed by the prime minister and confirmed by the Council of Representatives. Divisions: 18 governorates (muhafazat, singular - muhafazah) — Al Anbar, Al Basrah, Al Muthanna, Al Qadisiyah, An Najaf, Erbil, As Sulaymaniyah, Kirkuk, Babil, Baghdad, Dahuk, Dhi Qar, Diyala, Karbala', Maysan, Ninewa, Salah ad Din, Wasit. There is one federal region, Iraqi Kurdistan, comprised of parts of Erbil governorate; the governorates of As Sulaymaniyah and Dahuk; and parts of Ninewa, Kirkuk, and Salah ad Din that Peshmerga forces occupied on March 19, 2003. Nominal GDP (2011 est. ): $108.6 billion. Nominal GDP per capita (2011 est., PPP): $3,877. GDP real growth rate (2011 est. ): 9.6%. Rate of inflation (2011 est. ): 5.0%. Unemployment rate (2009 est. ): 15.3%. Budget (2011 enacted): Revenues: $69.2 billion; expenditures — $82.6 billion. Public debt (Sept. 2011 est. ): $53 billion to $79 billion. Agriculture: Products: wheat, barley, rice, corn, chickpeas, beans, dates, cotton, sunflowers, cattle, sheep, and chickens. Industry: Types: petroleum, chemicals, textiles, construction materials, food processing, fertilizer, metal fabrication/processing. Trade: Exports (2011 est. ): $62.3 billion; export commodities — crude oil, crude materials excluding fuels, food and live animals. Export partners (2010) — U.S., India, South Korea, China. Imports (2011 est.) — $61.0 billion; import commodities — food, medicine, manufactured goods. Import partners (2009) — Turkey, U.S., China, and South Korea. 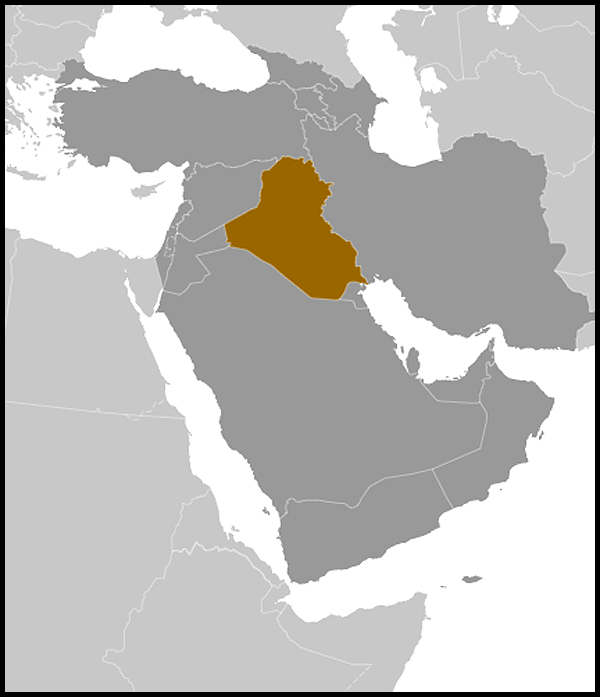 Iraq is bordered by Kuwait, Iran, Turkey, Syria, Jordan, and Saudi Arabia. The country slopes from mountains over 3,000 meters (10,000 ft.) above sea level along the border with Iran and Turkey to the remnants of sea-level marshes in the southeast. Much of the land is desert or non-arable. The mountains in the northeast are an extension of the alpine system that runs eastward from the Balkans into southern Turkey, northern Iraq, Iran, and Afghanistan, terminating in the Himalayas. Average temperatures range from higher than 48°C (120°F) in July and August to below freezing in January. Most of the rainfall occurs from December through April and averages between 10 and 18 centimeters (4-7 in.) annually. The mountainous region of northern Iraq receives appreciably more precipitation than the central or southern desert region. Almost 75% of Iraq's population lives in the flat, alluvial plain stretching southeast from Baghdad and Basrah to the Persian Gulf. The Tigris and Euphrates Rivers carry about 70 million cubic meters of silt annually to the delta. Known in ancient times as Mesopotamia, the region is the legendary locale of the Garden of Eden. The ruins of Ur, Babylon, and other ancient cities are located in Iraq. Iraq's two largest ethnic groups are Arabs and Kurds. Other distinct groups include Turkomen, Assyrians, and Armenians. Arabic is the most commonly spoken language. Kurdish is spoken in the north, and Armenian is also spoken by some in the remaining Christian community. English is the most commonly spoken Western language. The majority of Iraqi Muslims are members of the Shi'a sect (60%-65%), but there is a large Sunni population as well (32%-37%), made up of both Arabs and Kurds. Most Kurds are Sunni Muslim but differ from their Arab neighbors in language and customs. There also are communities of Christians (mainly Assyrians adhering to three main denominations, Assyrian, Chaldean, and Syriac), Sabean-Mandaeans, Yezidis, Bahais, Kaka'is, and Shabaks. Iraq's once-substantial Jewish community has almost completely disappeared from the country. In recent years, a large number of Iraqis have been displaced, and there are currently a reported 177,376 Iraqi refugees registered with the UN High Commissioner for Refugees (UNHCR) in Jordan, Syria, Lebanon, and other neighboring countries. UNHCR estimates that approximately 1.2 million Iraqis were displaced by sectarian violence following the Samarra Mosque bombing of February 2006 and remain internally displaced inside Iraq. For more information on Iraqi refugees, internally displaced persons, and conflict victims, please visit: (http://www.state.gov/j/prm/ra/index.htm). Once known as Mesopotamia, Iraq was the site of flourishing ancient civilizations, including the Sumerian, Babylonian, and Parthian cultures. Muslims conquered Iraq in the seventh century A.D. In the eighth century, the Abassid caliphate established its capital at Baghdad. The territory of modern Iraq came under the rule of the Ottoman Turks early in the 1500s. At the end of World War I, Ottoman control ended and Iraq came under the authority of a British mandate. When it was declared independent in 1932, the Hashemite family, a branch of which also ruled Jordan, ruled as a constitutional monarchy. In 1945, Iraq joined the United Nations and became a founding member of the Arab League. In 1956, the Baghdad Pact allied Iraq, Turkey, Iran, Pakistan, and the United Kingdom, and established its headquarters in Baghdad. Gen. Abdul Karim Qasim took power in a July 1958 coup, during which King Faysal II and Prime Minister Nuri as-Said were killed. Qasim ended Iraq's membership in the Baghdad Pact in 1959. Qasim was assassinated in February 1963, when the Arab Socialist Renaissance Party (Ba'ath Party) took power under the leadership of Gen. Ahmad Hasan al-Bakr as prime minister and Col. Abdul Salam Arif as president. In July 1979, Bakr resigned, and his cousin Saddam Hussein, already a key figure in the Ba'ath party and the RCC, assumed the two offices of President and RCC Chairman. The Iran-Iraq war (1980-88) devastated the economy of Iraq. Iraq declared victory over Iran in 1988 but actually achieved only a weary return to the pre-war status quo. The war left Iraq with the largest military establishment in the Gulf region and with huge debts. Iraq invaded Kuwait in August 1990, but a U.S.-led coalition acting under United Nations (UN) resolutions expelled Iraq in February 1991. After the war, Kurds in the north and Shi'a Muslims in the south rebelled against the government of Saddam Hussein. The government responded quickly and with crushing force, killing thousands, and pursued damaging environmental and agricultural policies meant to drain the marshes of the south. Coalition forces enforced no-fly zones in southern and northern Iraq to protect Iraqi citizens from attack by the regime and a no-drive zone in southern Iraq to prevent the regime from massing forces to threaten or again invade Kuwait. In addition, the UN Security Council required the regime to surrender its weapons of mass destruction (WMD) and submit to UN inspections. When the regime refused to fully cooperate with the UN inspections, the Security Council passed a series of Chapter VII sanctions to prevent further WMD development and compel Iraqi adherence to international obligations. Citing Iraq's failure to comply with UN inspections, a U.S.-led coalition invaded Iraq in March 2003 and removed the Ba'ath regime, leading to the overthrow of the dictator Saddam Hussein. Following his capture in December 2003 and subsequent trial, Saddam Hussein was executed on December 30, 2006, by the Government of Iraq. The Coalition Provisional Authority (CPA) assumed security and administrative responsibility for Iraq while Iraqi political leaders and the Iraqi people established a transitional administration. The CPA's mission was to restore conditions of security and stability and to create conditions in which the Iraqi people could freely determine their own political future. The UN Security Council acknowledged the authority of the Coalition Provisional Authority and provided a role for the UN and other parties to assist in fulfilling these objectives. The CPA disbanded on June 28, 2004, transferring sovereign authority for governing Iraq to the Iraqi Interim Government (IIG). Based on the timetable laid out in the Transitional Administrative Law (TAL), the IIG governed Iraq until elections were held on January 30, 2005; thereafter, the Iraqi Transitional Government assumed authority. In May 2005, the Iraqi Transitional Government appointed a multi-ethnic committee to draft a new Iraqi constitution. The new constitution was finalized in September 2005, and was ratified in a nationwide referendum on October 15, 2005. On December 15, 2005, Iraqis again went to the polls to participate in the first national legislative elections as established by the new constitution. The new 4-year, constitutionally-based government took office in March 2006, and the new cabinet was approved and installed in May 2006. By that time, following the February 2006 bombing of the Golden Mosque in Samarra, violence in the country was widespread. The ongoing violence and instability prompted the United States to increase troop numbers in Iraq (the "surge" in U.S. forces) in an attempt to improve the security situation and give Iraqi political leaders an opportunity to address the many problems that plagued the Iraqi people. Following the troop increase and adjustments to military strategy, violence declined, thereby providing political space and an improved environment for leaders to make progress on difficult national issues. In January 2009, two bilateral agreements between the United States and the Government of Iraq took effect: 1) the "Agreement between the United States of America and the Republic of Iraq On the Withdrawal of United States Forces from Iraq and the Organization of Their Activities During Their Temporary Presence in Iraq" (referred to as the "Security Agreement"), which governed the presence and status of U.S. forces in Iraq and addressed the withdrawal of these forces; and, 2) the "Strategic Framework Agreement for a Relationship of Friendship and Cooperation between the United States of America and the Republic of Iraq" (referred to as the "Strategic Framework Agreement" or "SFA"), which set out a variety of areas and aims for bilateral cooperation and formed the basis for a long-term partnership with the people and Government of Iraq and which remains in effect. On January 31, 2009, Iraq held elections for provincial councils in all provinces except the three provinces comprising the Iraqi Kurdistan Region, and Kirkuk province. On March 7, 2010, Iraq held national elections in which parties competed for positions in the Council of Representatives and the executive branch. In June 2009, in accordance with the bilateral Security Agreement, U.S. forces withdrew from cities, villages, and localities in Iraq. On August 31, 2010, President Barack Obama announced the end of major combat operations, the completion of the withdrawal of all U.S. combat brigades, and the transition of the role of the remaining U.S. military force of 50,000 troops to advising and assisting Iraqi security forces. On October 21, 2011, President Obama announced the full withdrawal of U.S. forces from Iraq by year's end pursuant to the Security Agreement. U.S. Forces-Iraq completed the withdrawal by December 18, 2011. A traditional security cooperation relationship is maintained through the presence of the Office of Security Cooperation-Iraq, which is comprised of a small group of U.S. military and civilian advisors and contractors who work with the Iraqi security forces, helping them to receive, maintain, and operate defense-related articles. Iraq is a parliamentary democracy with a federal system of government. The 2005 Iraqi constitution guarantees basic rights. The executive branch consists of the Presidency Council (one president and up to three vice presidents) and a Council of Ministers (one prime minister, three deputy prime ministers, and 30 cabinet ministers). The president is the head of state, protecting the constitution and representing the sovereignty and unity of the state, while the prime minister is the direct executive authority and commander in chief. The president and vice presidents are elected by the Council of Representatives. The prime minister is nominated by the president and must be approved by a majority of members of the Council of Representatives. Upon nomination, the prime minister-designate names the members of his cabinet, the Council of Ministers, which is then approved by the Council of Representatives. Subsequently, the prime minister and the new ministers are sworn in. The executive branch serves a 4-year term concurrent with that of the Council of Representatives. Iraq's legislative branch consists of an elected Council of Representatives (COR). After the 2005 elections, the Council of Representatives consisted of 275 members, each of whom was elected to a 4-year term of service. Pursuant to provisions for the March 7, 2010, elections, the COR expanded to 325 members to reflect an increase in the population of Iraq. At least one-quarter of the members of the Council of Representatives must be female. The responsibilities of the Council of Representatives include enacting federal laws, monitoring the executive branch, and electing the president of the republic. Iraq's judicial branch is composed of the Higher Judicial Council, Federal Supreme Court, Court of Cassation, Public Prosecution Department, Judiciary Oversight Commission, and other federal courts. The Higher Judicial Council supervises the affairs of the federal judiciary. The Federal Supreme Court has limited jurisdiction related to intra-governmental disputes and constitutional issues. The appellate courts appeal up to the Court of Cassation, the highest court of appeal. The establishment of the federal courts, their types, and methods for judicial appointments are set forth by laws enacted by the Council of Representatives. On January 31, 2009, Iraq held elections for provincial councils in all provinces except for the three provinces comprising the Iraqi Kurdistan Region, and Kirkuk province. On March 7, 2010, Iraq held national elections in which candidates competed for positions in the Council of Representatives and the executive branch. These elections were based on a new open list electoral system that provided for direct election of the members of the Council of Representatives, who in turn elect the president and approve the executive branch appointments. The Iraqi National Movement coalition led by former Prime Minister Ayad Allawi won the most seats (91), followed by Prime Minister Nuri al-Maliki's State of Law coalition (89 seats), the Kurdish bloc (headed by Kurdistan Democratic Party President Masud Barzani and Patriotic Union of Kurdistan President Jalal Talabani, with a total of 57 seats), the Iraqi National Alliance led by Muqtada al-Sadr (70 seats), and other smaller political and minority parties (18 seats). On November 11, 2010, the Council of Representatives convened to elect Jalal Talabani to a second term as President of Iraq. Osama al-Nujayfi of the Iraqi National Movement coalition was elected as Parliament Speaker. On December 21, 2010, the Council of Representatives approved President Talabani's nomination of Nuri al-Maliki for a second term as Prime Minister after Maliki proved able to secure the minimum parliamentary majority of 163 seats. The Council of Representatives also approved a majority of Prime Minister Maliki's Council of Ministers. Badr Organization [Hadi al-Amiri]; Da'wa al-Islamiya Party [Nuri Kamil al-Maliki]; Da'wa Tanzim [Khudayr al-Khuza'i]; Goran List [Nowshirwan Mustafa]; Independents Bloc [Husayn al-Shahristani]; Independents Bloc [Nuri Kamil al-Maliki]; Iraqi Front for National Dialogue [Salih al-Mutlaq]; Accord/Wifaq [Ayad Allawi]; Islamic Supreme Council of Iraq or ISCI [Ammar Adb al-Aziz al-Hakim]; Kurdistan Democratic Party or KDP [Mas'oud Barzani]; Patriotic Union of Kurdistan or PUK [Jalal Talabani]; Renewal/Tajdeed List [Tariq al-Hashimi]; Sadrist Trend [Muqtada al-Sadr]; Iraqiyoon [Osama al-Nujaifi]. Future Gathering [Rafi' al-Issawi]; Iraqi Justice and Reform Movement [Ajeel al-Yawer]; Iraqi National Congress/INC [Ahmad Chalabi]; Iraqi Turkoman Front [Saad al-Din Mohammed Amen]; Wasat [Ayad al-Samarai]; Islamic Virtue Party/Al-Fadilah [Ammar Tuama]; Kurdistan Islamic Union [Salah ad-Din Muhammad Baha al-Din]; Kurdistan Islamic Group [Ali Bapir]; National Reform Current [Ibrahim al-Ja'afari]; Sons of Rafidain [Salam al-Zowba'e]; White Iraqiyya [Jamal Bateekh]; National Movement of Reform and Development/Al-Hal [Jamal Karbouli]. Rafidan List/Assyrian Democratic Movement [Younadam Kanna]; Assyrian Chaldean Syriac People's Council [Khalis Estepho]; Shabak [Jamshed al-Shabaki]; Yezedi [Ameen Jejjo]; Sabi'/Manda'i [Khalid al-Roomi]. Historically, Iraq's economy was characterized by heavy dependence on oil exports and emphasis on development through central planning. Prior to the outbreak of the war with Iran in September 1980, Iraq's economic prospects were bright. Oil production had reached a level of 3.5 million barrels per day, and oil revenues were $21 billion in 1979 and $27 billion in 1980. At the outbreak of the war, Iraq had amassed an estimated $35 billion in foreign exchange reserves. The Iran-Iraq war depleted Iraq's foreign exchange reserves, devastated its economy, and left the country saddled with foreign debt of more than $40 billion. However, after hostilities ceased in August 1988, oil exports gradually began to increase, with the construction of new pipelines and the restoration of damaged facilities. But Iraq's invasion of Kuwait in August 1990, subsequent international sanctions, damage from military action by an international coalition in January and February of 1991, and neglect of infrastructure devastated Iraq's economy again. Government policies that diverted government income to key supporters of the regime and sustained a large military and internal-security force further impaired the economy and left the typical Iraqi facing desperate hardships. The UN created the Oil-for-Food (OFF) program in April 1995 (UN Security Council Resolution 986) as a temporary measure to provide for the humanitarian needs of the Iraqi people because of the effect of the continued sanctions regime. The military action of the U.S.-led coalition from March to April 2003 disrupted the central economic administrative structure. Since then, the rebuilding and enhancement of oil and utilities infrastructure and other production capacities has proceeded steadily, despite attacks on key economic facilities and internal security incidents. Iraq is now making progress toward establishing the laws and institutions needed to make and implement economic policy. Iraq's economy remains dominated by the oil sector, which currently provides about 90% of foreign exchange earnings. Oil production currently averages about 2.7 million barrels per day, of which about 2.2 million barrels per day are exported. Following three successful oil bid rounds, the Iraqi Government aims to dramatically increase production and export capacity over the next decade. The government must overcome some significant financial, technical, and infrastructure constraints to achieve stated goals, however. Iraq is seeking to pass and implement laws to strengthen the economy, including a hydrocarbon law that encourages development of the oil and gas sector and a revenue-sharing law that equitably divides oil and gas revenues among the central government, the provinces, and the Iraqi Kurdistan Region. Implementing structural reforms, such as bank restructuring and corporatization of state-owned enterprises, while simultaneously reducing corruption will be critical to encouraging sustainable economic growth based on the expansion of the private sector. Foreign assistance has been an integral component of Iraq's reconstruction efforts since 2003. At a donors' conference in Madrid in October 2003, more than $33 billion was pledged to assist in the reconstruction of Iraq. Following that conference, the UN and the World Bank launched the International Reconstruction Fund Facility for Iraq (IRFFI) to administer and disburse about $1.7 billion of those funds. The rest of the assistance is being disbursed bilaterally. Since 2003, international donors have pledged about $18 billion in financial and technical assistance, soft loans or potential loan facilities, and trade finance. International donors have exceeded their combined pledges for grants and technical assistance, totaling about $6.5 billion, by more than $1.3 billion. Total soft-loan pledges amount to about $12.8 billion, of which $6.5 billion has been committed. Japan is the leading soft-loan contributor, having committed nearly $3.3 billion to projects around Iraq. New programs approved by the International Monetary Fund (IMF) and World Bank will substantially close the gap between soft-loan pledges and commitments. In February 2010, the IMF and World Bank approved $3.8 billion and $250 million of support to Iraq, respectively. The IMF's Executive Board completed the first program review on October 1, 2010, and the second review on March 18, 2011, bringing the total resources currently available to Iraq under the arrangement to SDR 1069.56 million (about $1.7 billion). At the time of the second review, the program duration was extended by 5 months to July 2012, along with a re-phasing of program disbursements based on a shift in financing needs from 2010 into 2011. Both the IMF and World Bank programs are focused on helping the Iraqi Government maintain macroeconomic stability and mitigate Iraq's vulnerability to external shocks due to volatility in global oil markets. 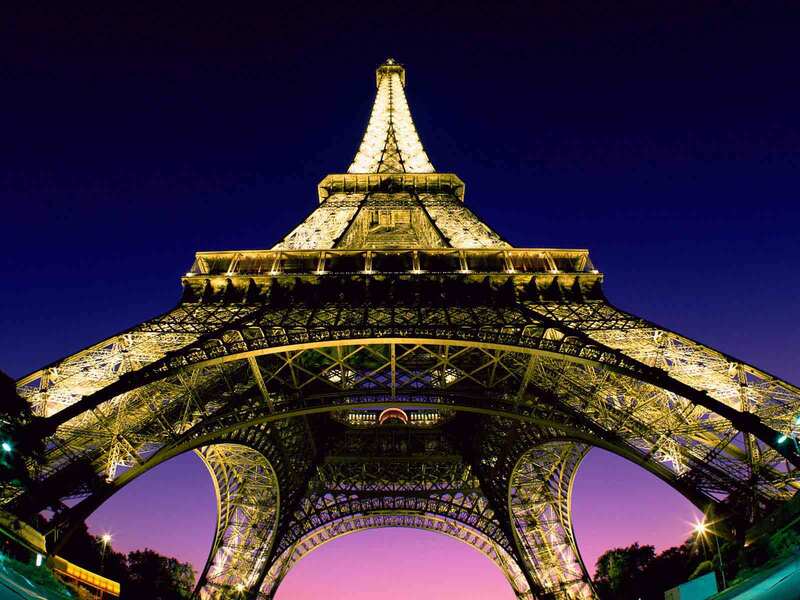 The Iraqi Government has worked closely with both institutions since 2003, including the December 2008 completion of an IMF Stand-By Arrangement (SBA), after which Iraq received the balance of the Paris Club's 80% debt reduction. U.S. foreign assistance to Iraq since 2003 has totaled $62 billion. The bulk of this assistance has gone toward reconstruction and security. The focus of U.S. foreign assistance in recent years has shifted from bricks-and-mortar reconstruction to technical assistance and capacity building. The U.S. Government is working with the Iraqi Government to build political, economic, rule of law, and civil society institutions throughout Iraq. For most of Iraq's recorded history, agriculture has been a primary economic activity. The agricultural sector is the second-largest source of jobs in Iraq after the public sector and the second-largest contributor to gross domestic product (GDP) after the oil and gas sector. Despite Iraq's land and water resources, however, agricultural production is well below its potential. Obstacles to agricultural development, most of which existed prior to the removal of the Ba'ath regime in 2003, include government policies and subsidies that distort the market and undermine productivity and competition; outdated technology in plant and animal genetics, fertilizers, irrigation and drainage systems, and farm equipment; inadequate and unstable electricity; degradation of irrigation-management systems; insufficient credit and private capital; and inadequate market information and networks. Since 2003, the U.S. Government has committed to improving the well-being of the Iraqi population through the development of Iraq's agriculture sector. The U.S. Government will continue to provide support to the Government of Iraq to modernize agricultural practices, improve agricultural policy decision making, and help Iraq transition to a private sector-driven agricultural system. The United Nations imposed economic sanctions on Iraq after it invaded Kuwait in 1990. Under the Oil-for-Food program, Iraq was allowed to export oil and use the proceeds to purchase goods for essential civilian needs, including food, medicine, and infrastructure-repair parts. With the lifting of UN sanctions after the Ba'ath regime was removed in 2003, Iraq is gradually resuming trade relations with the international community, including the United States. The United States designated Iraq as a beneficiary developing country under the Generalized System of Preferences (GSP) program in September 2004. Iraq was granted observer status at the World Trade Organization (WTO) in February 2004, and began its WTO accession process in December 2004. Iraq has participated in two Working Party meetings as part of the accession process, one on May 25, 2007, and the other on April 2, 2008. During this long-term process, Iraq must align its trade regime with the rules-based, multilateral international trade system. Through U.S. Agency for International Development (USAID) technical assistance, the United States has supported Iraq's accession to the WTO. Completion of the requirements for WTO membership will help Iraq establish a proven framework for fostering a more stable and transparent economy that will encourage both domestic and foreign investment. The Iran-Iraq war (1980-88) ended with Iraq sustaining the largest military structure in the Middle East, with more than 70 divisions in its army and an air force of over 700 modern aircraft. Losses during the 1990 invasion of Kuwait, and subsequent expulsion of Iraqi forces from Kuwait in 1991 by a UN coalition, resulted in the reduction of Iraq's ground forces to 23 divisions and air force to fewer than 300 aircraft. In April 2003, the Coalition Provisional Authority (CPA) officially dissolved the Iraqi military and Ministry of Defense. On August 7, 2003, the CPA established the New Iraqi Army as the first step toward the creation of the national self-defense force of post-Saddam Hussein Iraq. The Ministry of Interior, with coalition, U.S., and NATO assistance, trained and equipped new professional civilian police forces to establish security and stability. Initially under the command and control of the Multi-National Forces-Iraq (MNF-I) Command, in 2006 police and Iraqi Army units began to transition to Iraqi control. By November 2007, Iraq's 10 Army divisions had completed the transfer to Iraq's Ground Forces Command. The process of transferring provinces to Provincial Iraqi Control (PIC) began in July 2007, when Muthanna became the first province where Iraqi security forces took the leading role of security in a province. By December 31, 2008, all provinces had transferred to PIC. U.S. forces remained in Iraq under a UN Security Council mandate until December 31, 2008, and under the bilateral Security Agreement thereafter, continuing to provide security and support to the freely-elected government. On June 31, 2009, U.S. forces withdrew from Iraqi cities, villages, and localities, in accordance with the Security Agreement. By August 31, 2010, U.S. forces had drawn down to 50,000 troops in Iraq, whose mission changed from combat operations to advising, training, and assisting the Iraqi security forces. Pursuant to the U.S.-Iraq Security Agreement, U.S. Forces-Iraq completed its withdrawal from Iraq on December 18, 2011. The Office of Security Cooperation-Iraq (OSC-I), established under U.S. Embassy authority, has since continued U.S. efforts to train and advise the Iraqi security forces. The State Department Police Development Program (PDP) will provide mentoring and advice to senior Ministry of Interior (MOI) police officials, so that the MOI will be able to provide internal security in Iraq. With the fall of Saddam Hussein and the Ba'ath regime, Iraq has taken steps toward re-engagement on the international stage. Iraq currently has diplomatic representation in 54 countries around the world, including three permanent missions to international organizations: the United Nations in New York, the United Nations Human Rights Council in Geneva, and the Arab League in Cairo. Forty-three nations have diplomatic representation in Iraq. The Republic of Iraq belongs to the following international organizations: United Nations (UN); Arab League (AL); World Bank (WB); International Monetary Fund (IMF); International Atomic Energy Agency (IAEA); Nonaligned Movement (NAM); Organization of Islamic Cooperation (OIC); Organization of Petroleum Exporting Countries (OPEC); Interpol; World Health Organization (WHO); G-19; G-77; Arab Bank for Economic Development in Africa (ABEDA); Arab Fund for Economic and Social Development (AFESD, suspended); Arab Monetary Fund (AMF); Council of Arab Economic Unity (CAEU); Food and Agriculture Organization (FAO); International Bank for Reconstruction and Development (IBRD); International Civil Aviation Organization (ICAO); International Community for Radionuclide Metrology (ICRM); International Development Association (IDA); International Development Bank (IDB); International Fund for Agricultural Development (IFAD); International Finance Corporation (IFC); International Federation of Red Cross and Red Crescent Societies (IFRCS); International Labor Organization (ILO); International Maritime Organization (IMO); International Mobile Satellite Organization (IMSO); Intergovernmental Oceanographic Commission (IOC); International Organization for Standardization (ISO); International Telecommunications Satellite Organization (ITSO); International Telecommunication Union (ITU); Organization of Arab Petroleum Exporting Countries (OAPEC); Permanent Court of Arbitration (PCA); United Nations Conference on Trade and Development (UNCTAD); United Nations Education, Scientific, and Cultural Organization (UNESCO); United Nations Economic and Social Commission for Western Asia (UN-ESCWA); United Nations Industrial Development Organization (UNIDO); World Tourism Organization (UNWTO); Universal Postal Union (UPU); World Customs Organization (WCO); World Federation of Trade Unions (WFTU); World Intellectual Property Organization (WIPO); World Meteorological Organization (WMO); World Trade Organization (WTO) observer. The goal of United States policy is an Iraq that is sovereign, stable, and self-reliant. U.S. policy promotes a just, representative, and accountable Iraqi government. The Strategic Framework Agreement (SFA) — which covers the range of bilateral issues including diplomacy, security, economy, energy, judicial and law enforcement issues, services, science, culture, education, and environment — provides the basis for the U.S.-Iraq bilateral relationship. Efforts to implement the SFA are overseen by the Higher Coordinating Committee (HCC) and several Joint Coordination Committees (JCCs). Vice President Joseph Biden and Prime Minister Maliki convened the HCC on November 30, 2011 in Baghdad to discuss both ongoing and future efforts to strengthen relations. Prime Minister Maliki visited Washington, DC in December 2011 to meet with President Obama and other senior officials. During this visit, Secretary of State Hillary Clinton and Foreign Minister Hoshyar Zebari spoke at the opening of the Political and Diplomatic Joint Coordination Committee, a meeting convened to discuss key political issues between the U.S. and Iraq. Additional JCCs covering various aspects of the SFA will convene and continue to coordinate this partnership moving forward. American travelers must apply for a visa prior to travel to Iraq. The visa application, application process, and further information can be found on the Iraqi Embassy's website at (http://www.iraqiembassy.us/).